Well, it finally had to come to an end, and what an end! The third segment of the famous novel, adapted by Fran Walsh, Philippa Boyens and Peter Jackson, is the best of the three films, and closes the story in majestic fashion. Return Of The King (ROTK) is a stupendous film, easily the best film of 2003, and one of the very best of all time. The film is spot on. It is hard to imagine a better retelling. The two previous films have drawn the characters and the setting in fine detail, and the character arcs have been set in place, with only their resolution needed. The separate story-threads of The Two Towers (TTT) eventually converge at the massive battle of Pelennor Fields, where the doom of all the peoples of the West is to be defeated by Sauron’s amassed armies. Meanwhile, Frodo and Sam are still labouring toward Mordor, with the help of their guide, Gollum. The outcome is most likely well known to all readers, the book being the most loved novel of all time, but given our spoiler policy, I won’t tell it here. Peter Jackson always said he preferred the third film, for the emotion it contained, and I couldn’t agree more. 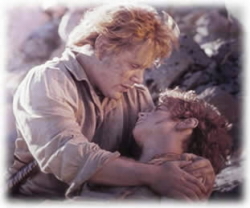 The heart of Samwise The Brave is the heart of this film – his love for Frodo, his Gaffer, and The Shire is the main reason this film succeeds as it does. Astin does a remarkable job in this portrayal, and his snubbing by the Academy only shows them for the fools they are. Were Astin less skilled, or Jackson less sensitive to the emotional development of the characters, the film would be but a shadow of what was achieved here. The score is spectacular, Howard Shore continuing his amazing work of Fellowship Of The Ring (FOTR) and TTT, and completing his thematic development with a flourish. The variation to “Concerning Hobbits’ from FOTR which is then played on the hobbits’ return to The Shire END SPOILERS is able to convey the change that has been forced on them all, Frodo in particular. The insertion of melodies from the final ending at a point of major Sam heroism also impressed me. The effects are marvellous – the lighting of the beacons of Gondor and Rohan is the obvious highlight. The battle scenes are spectacular in scope, although none of the battles in this film can match the fight at Parth Galen at the end of FOTR for emotional impact. Costumes, Make-up and cinematography all are superb; at no time does Middle Earth feel anything less than true, nor ROTK history. The only major downside is that some of the characters are less well developed – Legolas, Gimli and Merry all miss out. Arwen is also only minimally involved, one of Jackson’s better directorial choices. Pippin, on the other hand, who was previously reduced to comic relief, is allowed to grow and shine. Faramir gets some needed screen time and heroics, although his scenes in the Houses of Healing are strangely absent. The deviations from the book, although frustrating for a purist, should not really affect the review of the film. It stands alone as a great film, even if I and many others would have loved certain sections of Tolkien’s plot to have been left unaltered. Perhaps the extended edition will redress this problem, as it did in TTT. Jackson has crafted an exceptional film, one that should be seen by those of all ages. The Lord Of The Rings trilogy has been a cultural milestone, and its effect on film-making into the future can only be guessed at. Its place in history, however, is assured. This entry was posted in Film Reviews and tagged Fantasy, Science Fiction by Mark Lavercombe. Bookmark the permalink. It’s interesting, but now that I have read Mark’s incredibly praiseworthy review, I feel the need to be quite critical, even though I loved this film. Now, it should be established here that I loved Fellowship. I thought the film was near-perfect – it looked awesome, the acting was superb and it was a great adaptation of a great book. Then along came The Two Towers… I was bored shitless for most of the film. I found the first half incredibly slow and boring, and the climactic battle failed to grab me. So I had been hoping beyond hope that the third installment would be better than the second. Thankfully it was. Because Mark has already written his review (possibly one-handed) I’m going to do my best to only focus on certain things that bothered me about The Return Of The King. Now, I’ve seen the film twice at the cinema, and loved it both times (although during the second occasion I spent most of the film saying ‘I wanna see the elephants!… Hurry up! I wanna see the elephants!’ – much in the same way that a whinging five year old would be pulling on their parent’s jeans in a zoo). But I’ve since come to realise that by the time we get to the third installment the film was all about the spectacle. In this way it kinda resembles one of the Star Wars prequels – it’s about the WOW factor. I didn’t feel that there was as much depth to the characters as previously – there simply wasn’t enough time in between all the huge special effects sequences. There are some moments when you want to get up and cheer, but nothing even comes close to the skirmish at the end of the first film. The end of The Fellowship was so full of emotion that you couldn’t help shadow boxing in your seat. There were so many changes made in the second film, that by the time we reached number three I didn’t really care that they had deviated so much from the book. Miranda Otto rocked, and did a superb job of being strong yet delicate at the same time. In fact it’s interesting to watch because most of the time we have female heroes on screen they’re usually fairly masculine and downplay their femininity. This has applied to many characters, from Trinity in The Matrix to The Bride in Kill Bill, (although Tarantino attempted this in Part 2 but failed for the most part). There are cases where the heroes are sexual objects (such as in Lara Croft: Tomb Raider) but it’s rare to see a female character play the hero in a feminine manner. It’s like story tellers start with a traditional male hero and then just give it breasts. I think that this tradition has been selling female heroes short. Rather than simply moulding a female character with overtly masculine traits, it’s much more interesting and challenging to actually redefine the concept of a hero. This can lead (and did in the case of ROTK) to a fascinating and original dynamic in battle. Our three main adventurers who took up most of The Two Towers have much less to do in this film, and that’s not such a bad thing since I got sick of Gimli’s comic relief. (Hey, I respect fantasy stories… dwarfs rock… they don’t always walk around complaining with ego’s taller than themselves). I guess the main thing part three had going for it was the pacing. Whilst the first film could take its time revealing the world (and provoking a sense of wonder) the second film was most definitely sluggish at times. The Return Of The King, however, moves at a cracking pace, and in fact I didn’t notice the extra half hour or so – it seemed the same length as the first two. It is a fantastic, grand-scale film, only occasionally becoming silly and over the top (such as Sam’s Big Speech™), and whilst I’m sure it doesn’t stand so well on its own, The Return Of The King is a thrilling climax to the series.